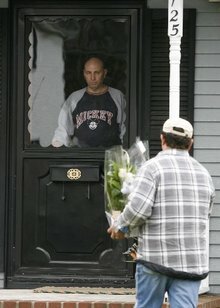 JENNIFER BROWN/THE STAR-LEDGER Joe LaPorte, father of Matt LaPorte, waits at front door of his home in Dumont as flowers are delivered. Matt La Porte of Dumont, one of the 32 victims of the shooter at Virginia Tech, was described by friends today as a quiet, standup guy, incredibly fit, for whom the military was just a natural extension of his own personality. "He was average size, but a workout warrior," said Ray Calilung, who, along with the 20-year-old La Porte, was a cadet in the Air Force Special Operations Prep Team at Virginia Tech. "If he could have gotten out of that classroom, he would. He would have dived out a window." "It would have taken a bullet stop him." La Porte's goal, friends said, was to work in Air Force Intelligence. He was a drummer in the military marching band, loved Van Halen and AC/DC, ran and lifted weights every day, and made the honor role most for most of his high school career. "He was one of those kids who probably didn't need to go to military school ... that just tells you about his strong work ethics," said Joe Kim, a classmate during La Porte's five years at Carson Long Institute, a military academy in Pennsylvania. In Brodie Hall, the VT cadet dormitory, today, the quiet was broken by a sobbing cadet as word spread that La Porte had been shot in French class, about a quarter mile from his dorm. "He didn't need to be the center of attention, but he had a wry sense of humor and every once in a while, he would surprise you," said David Lundin, a senior cadet who knew La Porte since his freshman year. In the middle-class Dumont neighborhood where La Porte grew up, neighbors fondly remembered him as the respectful little boy who loved animals and helping his dad in the yard. He had a pet turtle and a rabbit, and a shy little smile. "He was always taking off on his bike. Then he went off to school, and every time he came home ... he'd grown another foot," said Jen Oliver, who moved down the street from the La Portes when Matt was 6. "Then it was, oh my god, Matthew's driving now," she added. "I can't imagine the horror" his family is feeling now. La Porte, who graduated from the military academy in 2005 before enrolling at VT, kept his hair in a crew-cut and always calling his next-door neighbor Marie Grieco "ma'am." "Loosen up," she said he told him. "I'm Mrs. Grieco ... He was a wonderful boy, very respectful, a good boy from a good family. He was a great, great kid with a great future ahead of him." La Porte's parents met with their parish priest this afternoon inside their modest home. Father Jim Bouffard, the pastor of Sacred Heart Parish of Haworth, said the family had not decided whether they will travel to Virginia. "They're devastated," Bouffard said. "They have a lot of decisions to make. They haven't made any yet." He said that Joe and Barbara La Porte "are people of faith, which I think is getting them through this in pretty good fashion." The priest said he's known the La Porte family for 20 years. "What you can you do?" he said. "You cry with them, you give them a lot of hugs and advise them where you can advise them." "The family is the most wonderful family," Grieco said. "I don't know what to do. We're a very friendly, close neighborhood. It's hitting so close to home ... you bury your parents, not your children." Classmates at both the military academy and Virginia Institute called La Porte a "brother." "I lived with him for three years (at CLI) and he was his own person. I don't remember when he wasn't on honor roll," said classmate Arturo Diaz of Vernon. "He was so disciplined, between military school and his first year as a cadet at VT, that it was only this year that he could start to live as a real student and enjoy life." 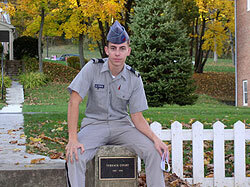 "The bonds and brotherhood that all CLI cadets endure is utterly indescribable," said Kim. "That's why I feel as if I lost a brother today."